They bill themselves these days as “The Longest Running U.S. Ska Band,” but I always think of them as “The Hardest Working Band in Ska.” The Toasters have been doing what they’ve been doing for 33 year years, touring nationally and internationally, and few others in this world can say that. 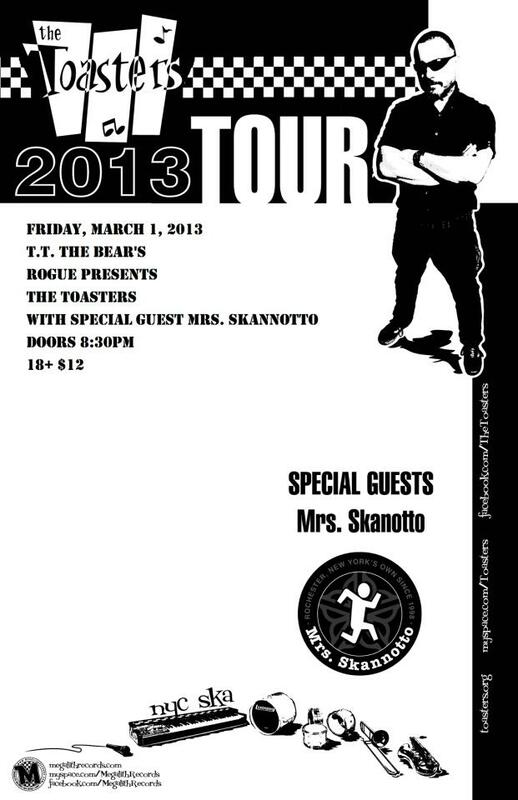 This Friday, they play at TT The Bear’s in Cambridge. I was able to have a few words with Rob “Bucket” Hingley, lead singer, guitarist, and songwriter for the band, and founder of Moon Ska Records (1983-200) and Megalith Records (est. 2002). As a loyal fan, my first question is always, who’s in the crew? Bucket’s always got the most top notch musicians behind him and this year’s tour is no different. Joining on Bass is Thaddeus Merritt of Westbound Train. On drums, is Vito Fraccalvieri, formerly of Royal City Riot (the Long Island ska band I miss the most right now). Chap Sowash of Green Room Rockers joins on Trombone and Jon Degen, also of Royal City Riot, on sax to round out the horn section. Needless to say, the band is solid. Personally, I’m always curious what the best date of any tour is. Without any hesitation (at least, as much as I could tell over an email exchange), the answer was the February 9th “Ska Wars” in LA. This 2-stage, 32-band festival at WLCAC Outdoors is a real testament to the local scene. Take a look at the line up and poster on Facebook. 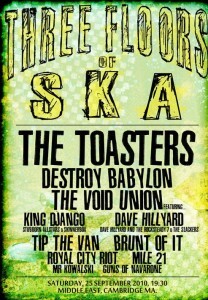 The last Three Floors of Ska at the Middle East was a great gig. But we also had a sold out show at Johnny D’s last time round so Boston is very solid for us at the moment. Boston has replaced NYC as the East Coast home of ska music. Sorry to say it, but it’s now the truth. There is for example, currently NO regular ska gig in Manhattan. I think that speaks very highly of how hospitable Boston is. Having just moved from Brooklyn (and being fortunate enough to open for The Toasters while in a few bands in NYC), I’m not sure I agree with that statement but it’s interesting to hear from the guy who spearheaded the scene from NYC in the 80s and 90s. What do you think? Where does Boston stand? 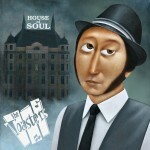 Do you have a memorable Toasters show? Leave your thoughts in the comments. John DeCarlo played guitar for Westbound Train. [Show Recap] The Toasters Bring the Party!